David Johnston is like many of us – he loves cars of every description. For Barrett-Jackson’s 2019 Scottsdale Auction, he’ll prove the point by consigning seven cars from very different parts of the car collecting world, all with No Reserve, so they’ll be going home with the highest bidder. First up is a 1957 A.J. 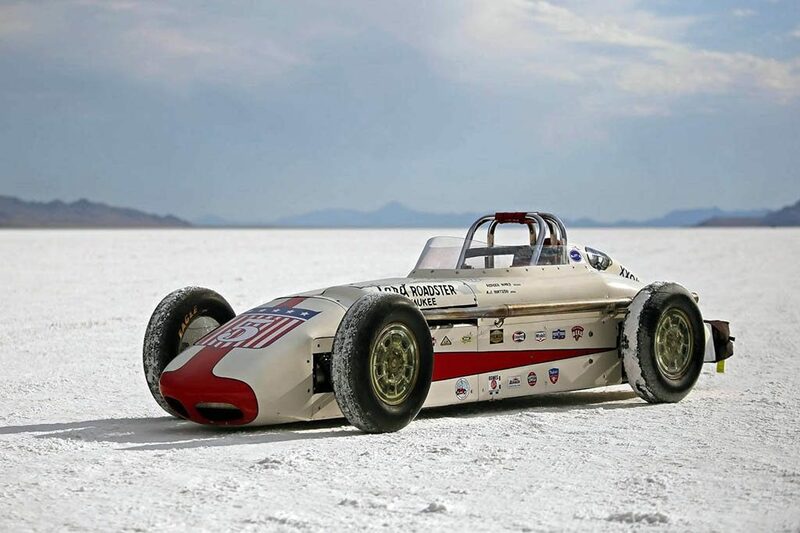 Watson Indy roadster re-creation that’s been specially built for action at Bonneville Speed Week, where it claimed a world record of 181.47 mph in 2012. Best of all, construction of this straight-line record-setter was done with help from A.J. Watson himself. Watson burst onto the Indy scene quite suddenly when his first car put Pat Flaherty in the winner’s circle at the 1956 Indy 500. His recipe for Indy success evolved out of pioneering work done by Frank Kurtis during the immediate post-WWII era. While prewar Indy cars still mostly retained hefty ladder-frame construction, Kurtis embraced aircraft construction techniques by substituting lightweight tubular steel and monocoque construction. The Kurtis dynasty was formidable until Watson’s mid-50s reinterpretation. Watson’s spin on the Kurtis recipe was to position the Offy engine bolt upright, rather than using Kurtis’ 36-degree tilt to the right. 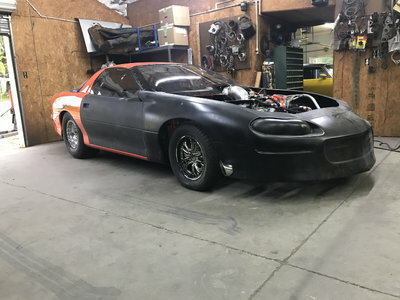 Then he moved the entire engine, transmission, driveshaft and differential feed point 3 inches farther to the left of center (12 inches instead of Kurtis’ 9 inches). Next, Watson reduced the track width 5 inches (the space between the tires, not the Brickyard’s fabled surface), and finally he positioned the entire body – from the radiator opening to the bullet-shaped tail cone – 1.5 inches to the left of the centerline of the track width. These changes had the effect of shifting a still greater percent of the car’s static weight to the inside tires, while also giving Watson-built cars a unique offset appearance – with more space between the tires and body on the right-hand side of the car than the left. Watson’s run of success ended in 1965, when Colin Chapman’s rear-engine Lotus-Fords made front-engine racers obsolete once and for all. 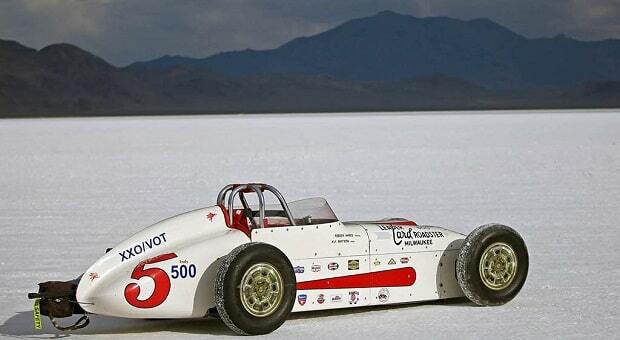 In the case of this 1957 Watson replica, the flavor and mood of a 1957 Indy champ car has been captured thanks to the use of Watson chassis and body plans and blueprints – but with the intention of driving on the vast Bonneville Salt Flats. Conjured in A.J. Watson’s Indiana shop in 2012, it features a chromoly tube frame with a 100-inch wheelbase and SCTA-certified funny car-style roll cage. External panels pay tribute to its Indy forebearers with full A.J. Watson body panels and a 1959 Watson shark-spec nose. 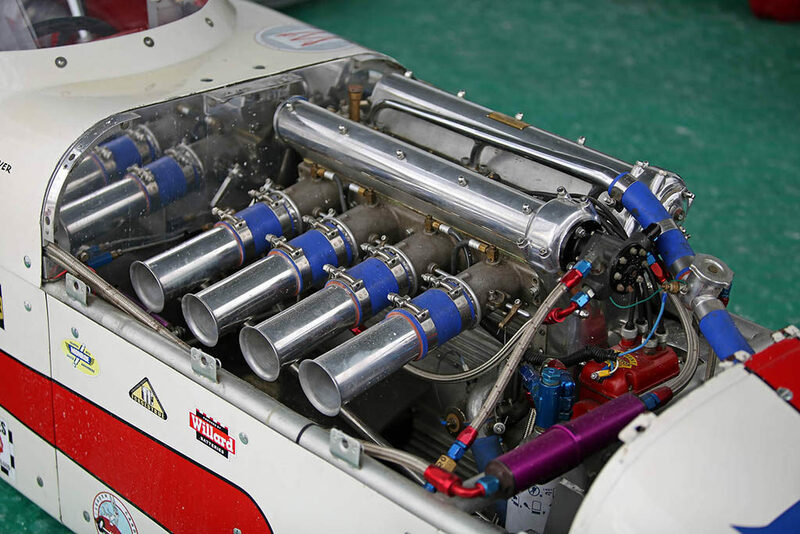 Power comes from a 270ci DOHC Offy that’s one of 160 ever made and said to be the only one still in active race competition. Inhaling through Hilborn direct-port mechanical fuel injection, dyno tests have shown it makes 425 horsepower and 550 ft/lbs of torque. A Winters Phoenix transmission sends power to the Winters rear axle through an enclosed driveshaft. Braking is handled by Wilwood rear discs and a DJ parachute. 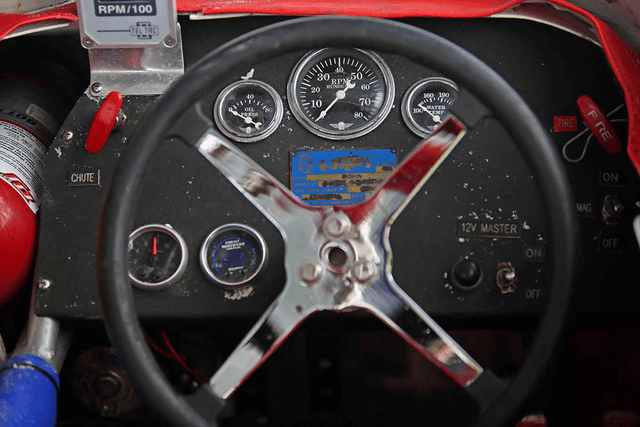 Ready to race at Bonneville – or any suitable closed course – this modern record-setter pays tribute to the final days of the Indy roadster. John “Gunner” Gunnell has been writing about cars since ‘72. As a kid in Staten Island, N.Y., he played with a tin Marx “Service Garage” loaded with toy vehicles, his favorite being a Hubley hot rod. In 2010, he opened Gunner’s Great Garage, in Manawa, Wis., a shop that helps enthusiasts restore cars. To no one’s surprise, he decorated 3G’s with tin gas stations and car toys. Gunner started writing for two car club magazines. In 1978, publisher Chet Krause hired him at Old Cars Weekly, where he worked from 1978-2008. Hot rodding legend LeRoi “Tex” Smith was his boss for a while. Gunner had no formal journalism training, but working at a weekly quickly taught him the trade. Over three decades, he’s met famous collectors, penned thousands of articles and written over 85 books. He lives in Iola, Wis., with his nine old cars, three trucks and seven motorcycles.